I cannot believe how long it has been since my last post. A few days after that, I got the flu, then a mixture of hectic schedule and procrastination delayed me. Last week, however, I wrote a post and am now posting. In fact, this is something I have been wanting to write about for quite a while. Linking the two is crucial because so many common habits are detrimental to our future, so our children’s futures. First, I will define parenting using both my personal opinion and what I perceive to be a common basic role of a parent. Second, I will explain what I mean by environmentalism for the purpose of this post. Third, I will discuss how these are linked, finally concluding with some remarks about my own efforts. As seen in a quick search, parenting seems to be commonly defined as the rearing of a child from birth to adulthood. This refers to all developmental elements: physical, emotional, social, and intellectual. In other words, parenting is about supporting the growth of the child, ensuring both the present and future lives of the child are safe and as comfortable as the parents can provide. In this philosophy/ideology/social movement, environmental health is at the forefront, with protection and improvement as being the primary concerns. Despite this being a common definition of environmentalism, there is an increasing shift towards recognizing that humans must desist attempting to control everything. Instead, we must work at better understanding the problem, finding ways for humans to live in harmony with our respective localities. It is also crucial to recognize that western knowledge (or science) is not always the best knowledge; often local or traditional knowledges are far superior, making them much more beneficial to human and environmental sustainability. Driving: it is well known that exhaust has significant impacts on the atmosphere, and many have surely linked the increasing number of oil spills to the oil we use to fuel our cars, as well as efficiency to car age/technical knowledge at the time of the make. BUT, how many people realize that even the newest of vehicles create a certain amount of pollution, coming from such things as aging tires and fuel/oil leaks? Further, how many people think about the health impacts of vehicles? These impacts are both due to environmental impacts, as well as to the replacement of walking, biking or using transit with driving. In fact obesity rates (which have many dire health impacts) increase with the use of cars, both in adults and children. Further, this creates irrational fears of the public, which I will discuss in a future post. Waste: do people not recall learning the 3R’s of recycling in primary school? Or was this limited to my region? It seems the first and most important R (reduce) has been not only forgotten, but reversed to be incRease. 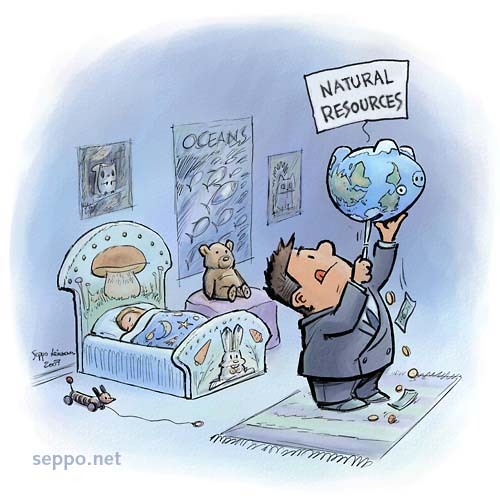 Rather than reducing consumption, people are rushing to expand their consumption levels, teaching children that materialism is far more important than the future. Not only are people consuming more and more, but the idea of Reuse has become a thing to be feared, as though one will die if they opt for a used item. Whenever you want to throw something out, ask yourself “can I reuse this jar? String? Newspaper?” ect. Giving old clothes, toys and gadgets should not be seen as something that can only go to the less affluent, but something which we all have an obligation to take part in, choosing pre-owned/used consumables, rather than new. Are you aware that the majority of the clothes you donate actually end up throughout Subsaharan Africa, severely impacting the local textiles industries and playing a significant role in increasing local dependence on the Western economy? As for Recycling, this must be a last resort. Even then, many choose to toss most everything in the trash, increasing the amount of waste in landfills, for which we are running out of space. Landfills are not regulated in the majority of the world, causing severe local and global pollution; even then, those which are regulated often leak into groundwater, polluting what available drinking water we have left. Water: on that note, not only do cars and waste affect our water, but so do we. Our overuse of water when in the home, through such things as leaving the water running when doing dishes, taking a shower, brushing our teeth, washing our hands, etc. play a huge role, but so do irresponsible water habits, such as cleaning our cars with a hose, cleaning our windows or drive/walkways with a pressure washer, etc. Water shortages are increasing globally, including in areas known to be water-rich, such as southern Canada. These shortages can be caused by any combination of climate change, overuse, privatization of water bodies, pollution, etc. These above points are in no way comprehensive, however they do remind us that we all have a responsibility to always make more and more efforts at improving our habits. As biological parents, we have brought [a] child[ren] onto this planet, so we have a responsibility to them and to their future. Each and every one of us has a responsibility to future generations, as we are borrowing the planet from them and when one borrows something, we must treat it with more respect than we treat something that is our own. Even if bearing children is not an option, or has not yet taken place, we all have children in our lives who are very important to us and they will eventually have children in their lives who are just as important to them. Many say that if others are not making an effort, then why should they? That is nothing more than an excuse; how many of us has been asked “if Jane were to jump off the bridge, does that mean you would jump too?” ? If parenting is about ensuring the safety and comfort of our children and environmentalism is about ensuring a safe and comfortable future, then there is no separating the two. Do I Practice Any of This? In no way am I perfect. There are surely many ways that I am having negative environmental impacts. I do not know them all, but those I do know are things I continually work at improving. What we must all recognize is that changing our ways takes time. Rather than comparing ourselves to an ideal, we must ask questions and learn more, making the changes we are comfortable making. With time changes we wanted to aspire to but were not yet comfortable making become parts of our daily lives. Sustainable Concordia’s R4 campaign has it right that before the 3R’s, we must first Rethink: rethink our consumption, rethink our impact on the environment, rethink our impact on other communities and rethink our impact on future generations. Even after 40 years, Ghana’s Sunlodge Hotel has continually maintained social and environmental responsibility when expanding their business.